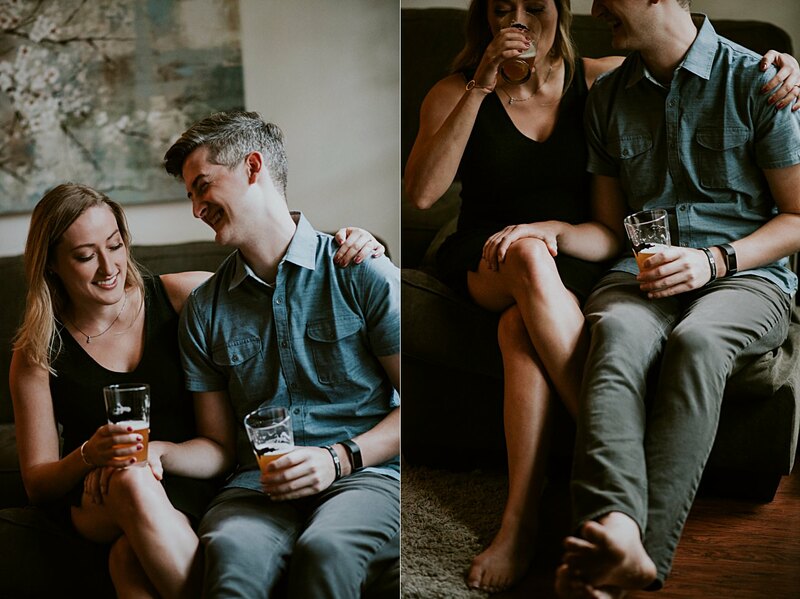 A fun engagement session in their home in Chicago Illinois. 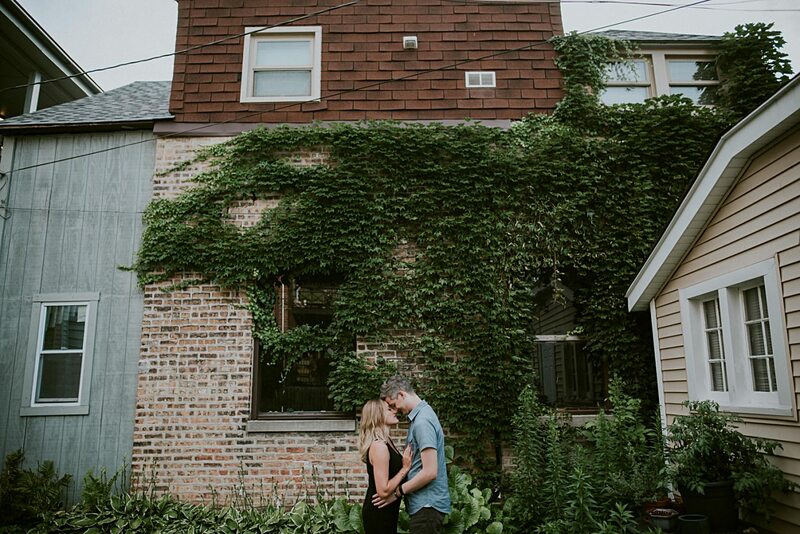 Jessica and Corbin invited us down to their home in Chicago for their engagement session. We started the session with an ice cold beer, why? 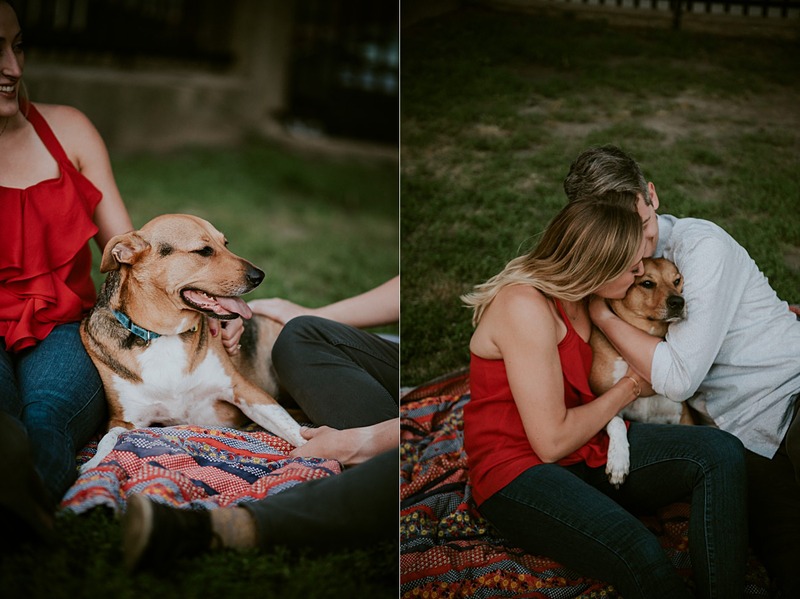 Well, it was hot outside AND it helps ya forget that your in-front of a camera 🙂 Engagement sessions can be stressful, you forget that you have hands and you don’t know where to look. 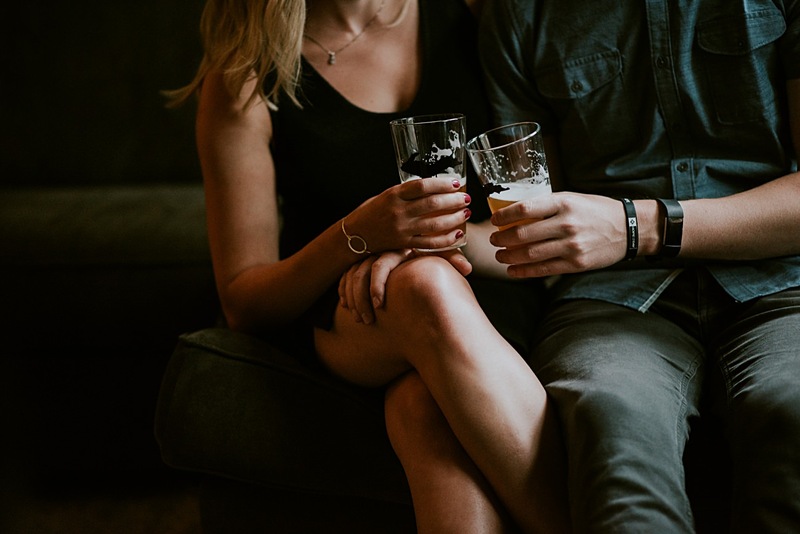 Sitting down with a beer relaxes it like we are just friends hanging out! 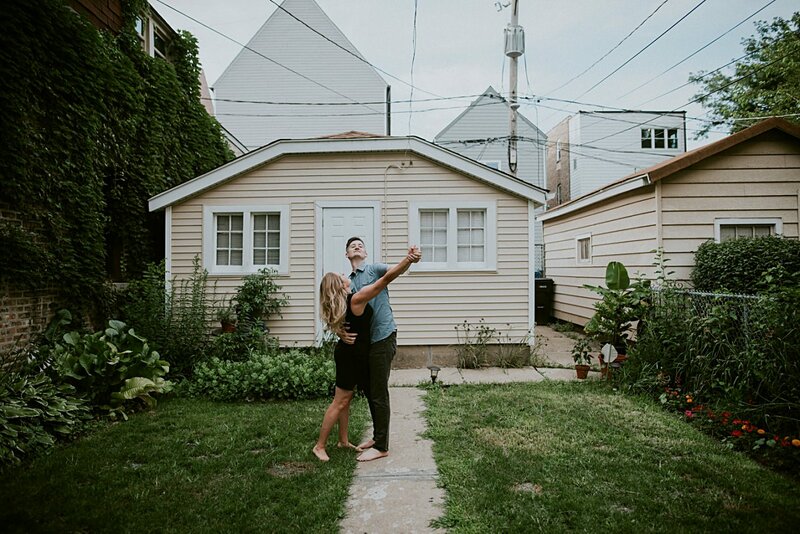 Their backyard was a dream to step into. A small garden and a wall covered in vines. 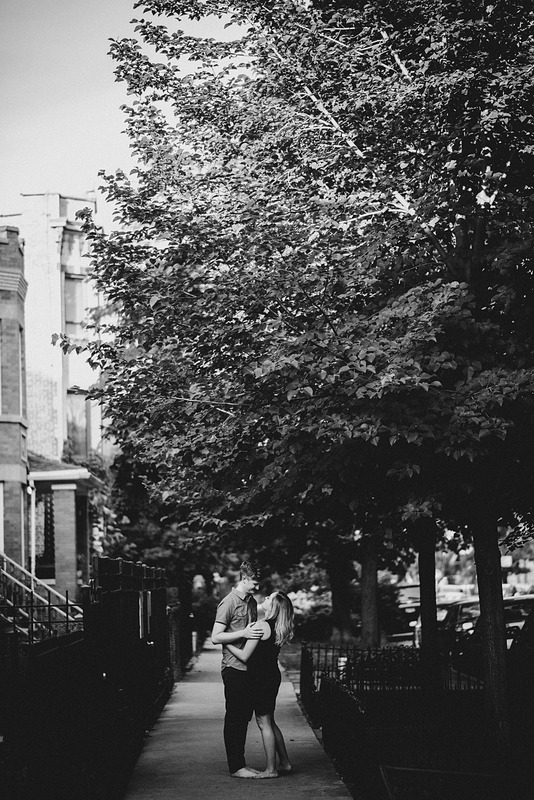 We ventured out on to their street as I am a sucker for tree-lined city streets. 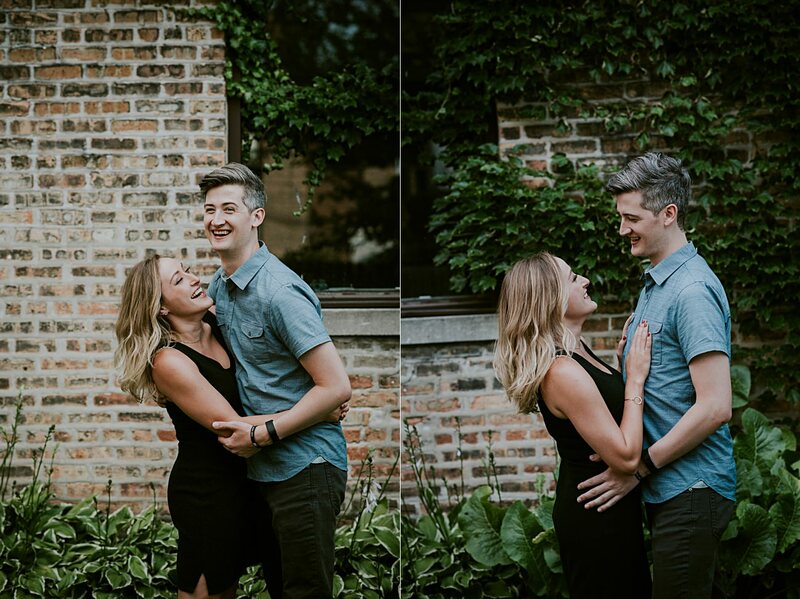 During each of these locations, Jessica and Corbin danced, laughed and non stop smiled. Now, let’s get to know their story! First Date: Jess asked Corbin if he wanted to go to a St. Vincent concert together in December 2014. At the beginning of the night, we thought we were two friends going to see a show. Halfway through the evening, however, we both realized it was a date. 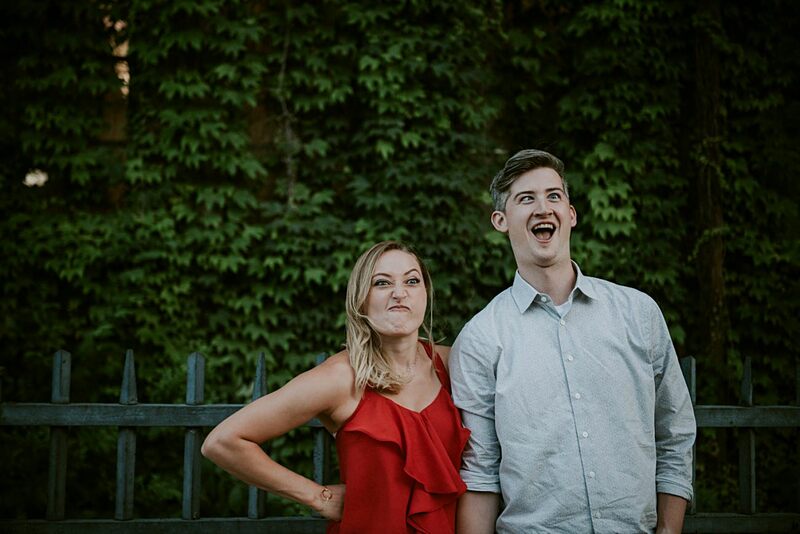 We officially started dating a few months later. 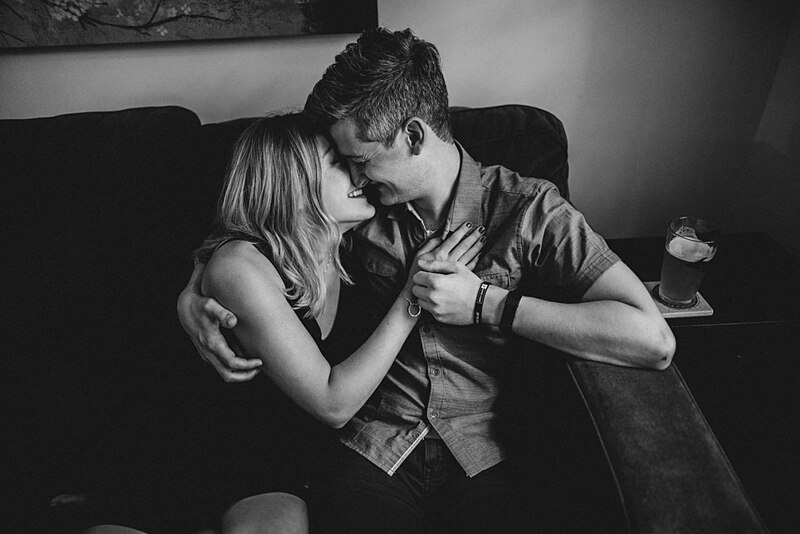 Proposal Story: Corbin was playing a show on a Saturday afternoon that Jess attended. We were throwing a holiday party later on that night. 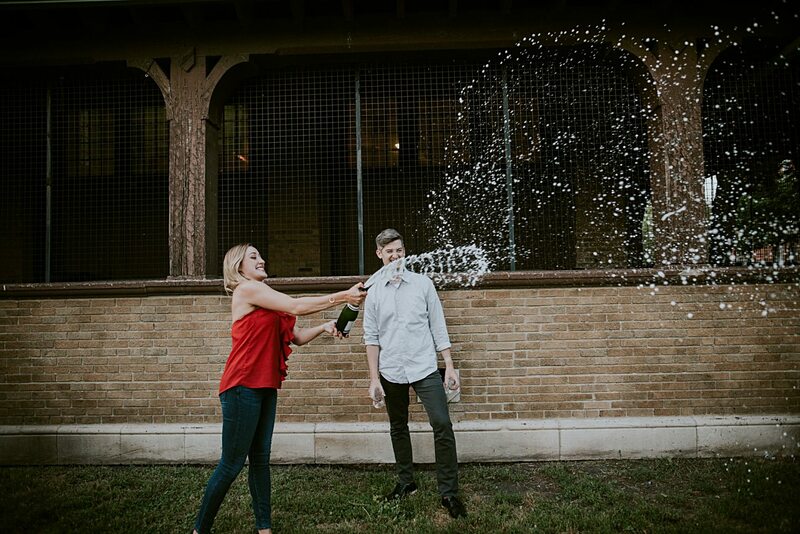 In order to buy himself some time to set up the house for the proposal, Corbin had Jess pick up booze for the party with a mutual friend. When Jess returned to the house, the lights were off but christmas lights were strewn across the floor. 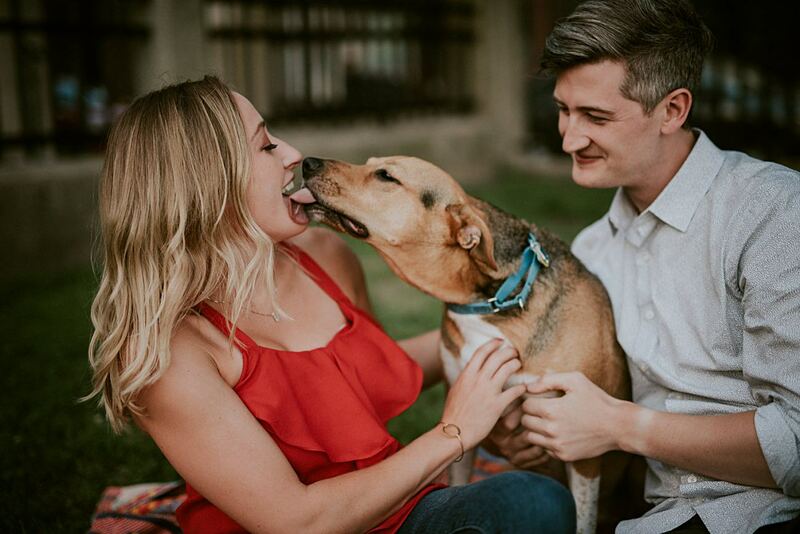 She wasn’t sure if Corbin was home because Ivy didn’t greet her at the door. Jess walked over to the lights and saw an orchid with a card with her name on it. 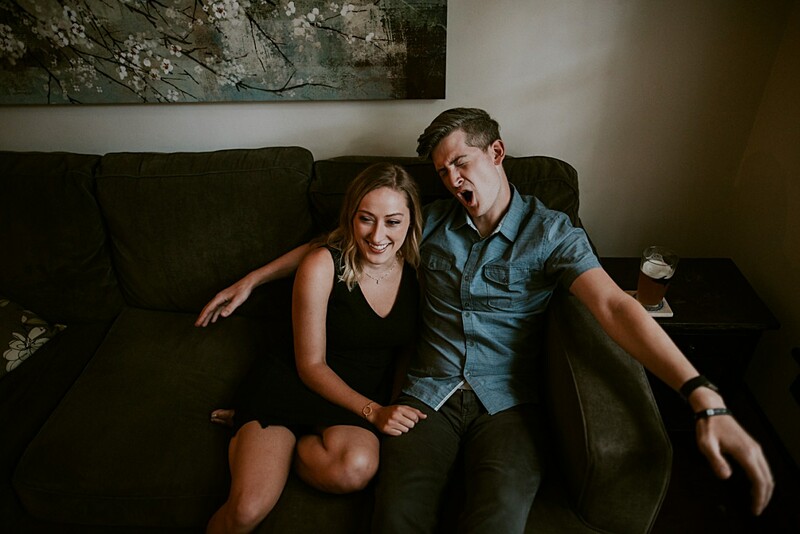 She thought “Oh this must be an early christmas present!” She turned around to see Corbin walking toward her, he had Stevie Wonder’s “Knocks Me Off My Feet” start playing and he immediately got down on one knee. He said “I don’t have a big long speech prepared, but I love you and I want to spend the rest of my life with you. 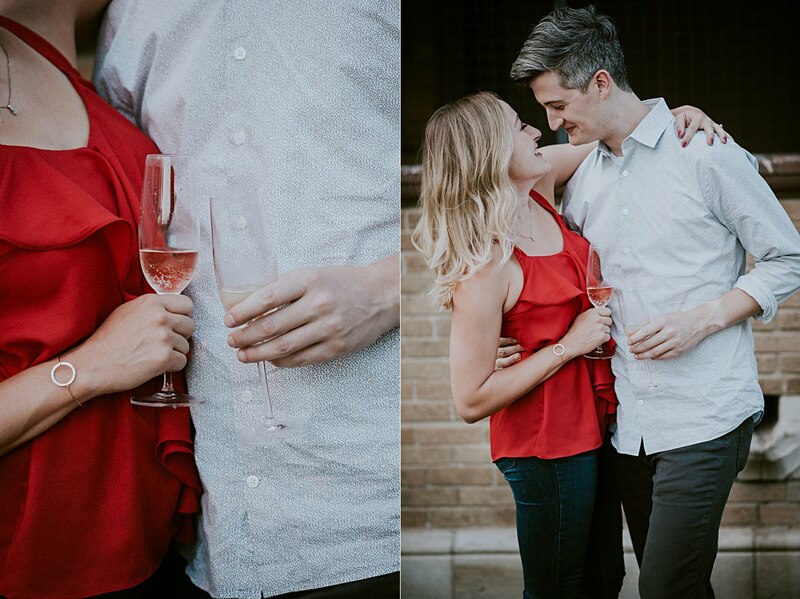 Will you marry me?” Hugs, tears, phone calls, and champagne ensued.